Borrego Springs celebrates the Citrus League title on Friday night. 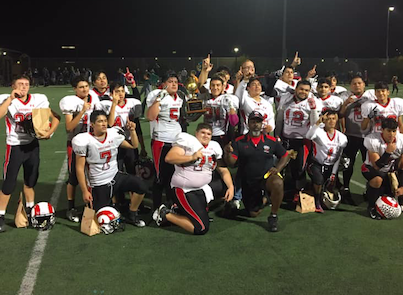 SAN MARCOS (10-27-2018) – In the school’s greatest campaign since its 2014 squad posted an undefeated regular season, the Borrego Springs Rams clinched the Citrus League 8-man football championship Friday, cruising past host St. Joseph Academy, 67-32, at Connors Park. In a battle between the league’s two remaining unbeaten squads in league play, the Rams (9-1 overall, 6-0 league) point total was the second-highest of the season; a week earlier, the Rams collected 71 points against Ocean View Christian, giving them 138 points over a two-week period. The Rams trailed 14-7 after the first quarter, but it was the second where Borrego Springs really blew the Warriors away with a 36-6 scoring advantage. With 391 points, the Rams lead all local eight-man teams in scoring this season. For St. Joseph (5-3, 5-1), it was still a remarkable turnaround for a program which went winless just last season. The Crusaders, based in San Marcos, starting playing football in 2007. The five victories tied for third-best in school history, but with two CIF playoff wins, they could still equal the school mark (7 in 2015). FOOTHILLS CHRISTIAN 28, JULIAN 6 – The Foothills Christian Knights will meet Borrego Springs in next week’s opening round of the CIFSDS playoffs, meeting in the Division VI (8-man football) semifinals at Seau Field, located at Parkway Middle School. Friday’s (Nov. 2) kickoff is slated for 7 p.m., but due to limited parking, fans are asked to arrive early. Foothills Christian enters as champions of the Ocean League. One week after downing arch-rival Calvin Christian of Escondido, 42-16, to snap the teams’ deadlock for first place, they knocked down host Julian up in apple country, 28-6, to cap the regular season, surviving an obvious letdown situation. The Knights and Eagles were deadlocked at 6-all at halftime, but Foothills scored two touchdowns in the third quarter. Junior quarterback KEVIN MROZ passed for two touchdowns and junior KEVIN HELFERS rushed for a touchdown and had a fumble return of 34 yards after senior NICHOLAS GRANT forced the turnover. Sophomores BLAKE MCINTYRE and MARTIN MASON SCHMIDT caught the scoring tosses from Mroz. Senior P.J. ZASTOUPIL also rushed for a touchdown for FCHS. The Knights average over 7 1/2 yards-per-carry on the night. McIntyre led the defense with nine solo tackles, while senior NICHOLAS GRANT added six solo stops. Junior HUNTER NICKELL had an interception and returned it 40 yards. Since returning to 8-man football in 2015, the Knights have posted a composite 29-10 overall record, including a 7-2 mark this season. A triumph over Borrego Springs will give the school its third-most victories since starting to play football in 2005. Head coach Joe Mackey owns the best single-season mark, going 11-1 in his first season (2016),and is now 24-6 in his career with the Knights.